An estimated two-thirds of the world’s population lives in areas that have water scarcity at least once a month, with about 500-million people living in areas where water consumption far exceeds locally renewable water resources. In fact, the High Level Panel on Water (HLPW) warned in a statement released on March 21, 2017, that the world might face a 40% water shortfall by 2030, affecting at least 1.80-billion people. South Africa could become one of these statistics, given that it is considered to be the world’s thirtieth-driest country. According to current projections, water demand in South Africa will increase by 1% each year from 15-billion cubic metres a year in 2016 to 18-billion cubic metres in 2030, resulting in a 17% supply deficit. Already, 30% of the country’s towns and cities have a water deficit and the situation is expected to be exacerbated by the effects of climate change. 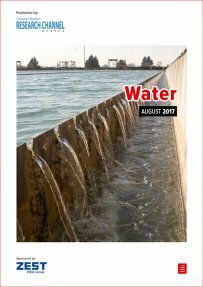 This edition of Creamer Media’s Water Report considers the aforementioned issues in not only a South African context but also an African and global context in terms of supply and demand, water stress and insecurity, and access to water and sanitation, and the challenges that come with these issues. Creamer Media's reports draws from material published over the past 12 months and are a summaries of other sources of information published in Engineering News and Mining Weekly, as well as of information available in the public domain. Published on: 25 August 2017.